The first time we had burrata was at Cafe Borrone. Burrata is an Italian cheese made from mozzarella and cream (source Wikipedia) and that is just what it tastes like…a super creamy and light mozzarella. It has an outer mozzarella ‘shell’ which is filled with this delicious creamy cheesiness. YUM. The owners of Cafe Borrone first had burrata on a trip to Italy and immediately knew they had to make it themselves when they got back to the States. 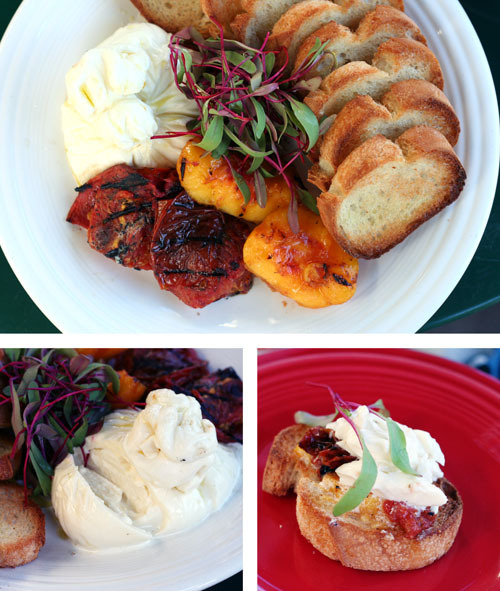 When Nate and I had their burrata, it was served alongside grilled peaches and tomatoes with a toasted baguette. And it was downright heavenly. Last week I had some nectarines that needed to be eaten pretty quickly, so I picked up a package of burrata at Trader Joe’s. I roasted the nectarines in the oven (grilling would work beautifully as well) and served them alongside the cheese, with fresh baguette. It was delicious. Roasted or grilled peaches are also amazing and of course grilled or roasted tomatoes would be great with burrata, too! The possibilities are endless! You could use peaches, apricots, plums or pluots instead of nectarines…whatever sounds good to you or whatever you have lying around the kitchen, just go with it! Cut nectarines in half and remove pit. Place in oven-safe dish. Drizzle with a bit of melted butter. Roast in a 350-degree oven until fruit is soft and looking a bit carmelized. Here’s where I stink…I can’t remember how long I roasted them for! 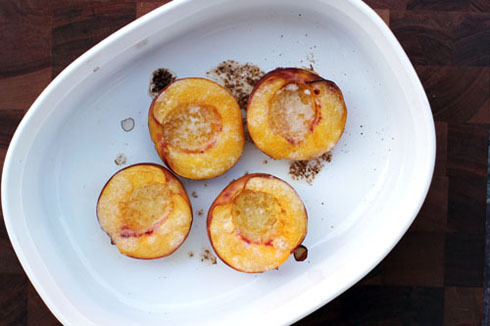 Probably 10-20 minutes…but I promise next time I roast some stone fruit, I will come back and update this recipe with an accurate cooking time. You can peel the fruit prior to roasting or afterwards…or not at all. Whatever you prefer. I peeled mine after they roasted – one of the nectarines peeled easily and the other one was more stubborn. Serve with burrata or other yummy cheeses. Or top with ice cream for a wonderful dessert! Jane – this sounds amazing!! I’m not sure where I can pick up some burrata (maybe Central Market here in Texas? ), but I know what I’m having for lunch/dinner on Saturday!!! I bought mine at Trader Joe’s…I know that http://www.belgioioso.com/ makes burrata, and I think my regular grocery store carries that brand of cheese although I haven’t looked to see if they have burrata. And I just went shopping today at one of our “fancier” grocery stores and they had burrata for sale. Oh wow! This sounds simply delicious and perfect for the summer palate. I had roasted peaches one time and I loved! The mix with cheese will be super yummy! As an amazing cook, what do you think of my bacon-blue cheese sliders!?! This sounds heavenly. I am craving fruit, so this would be a fun way to make nectarines or peaches. I can’t wait! I know this is soo off topic – but it is summer and blazing outside. You should chop some baby tomatos in half, get some fresh mozzerlla chop that up into bite sized pieces and toss with pesto! Yum, your girls will love it! Holy cow that looks amazing. I’m wondering if I can try it with apricots though, since those are in season & plentiful right now. yes, you can totally do apricots! 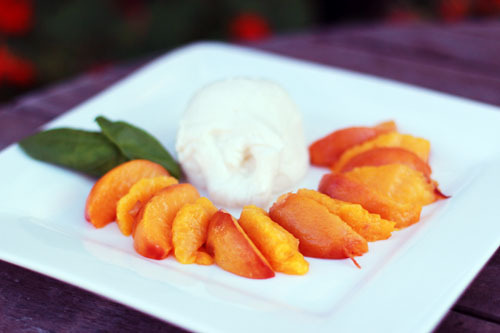 Sadly, we have no Trader Joe’s or anywhere to get burrata close or we would make this soon! There is no such thing as an :Italian version” of burrata. Burrata is made in the United States, in Canada, and in Italy – probably in other places as well. My cousin owns a cheese factory in Canada, where he personally makes the burrata. He is originally from Italy and moved to Canada decades ago. My friend Gigi makes burrata in her Everett, Massachusetts storefront called “Gigi’s House of Mozzarella.” The quality is about the technique, the skill of the cheesemaker, and the quality of the ingredients used, and NOT the country of origin. When I buy locally, I can choose from among Trader Joe’s, Bristol Farms, the Cheese Shop of Beverly Hills, Whole Foods, Ralphs, and Gelson’s. Guess which one sells “the most expensive” burrata? BTW, make sure the peaches/apricots are ripe enough. The outdoor barbecue is another way, as well as under the broiler. Be sure to add a touch of VERY GOOD balsamic.